This classic sailing boat has a well thought out design and layout, and is perfect for weekend jolly's or short trips over a few days or a long weekend. Well known to sail well, she has everything to hand and could easily be single-handed. The saloon table is a great size, and the area feels very spacious for the size of vessel, with a decent amount of storage. 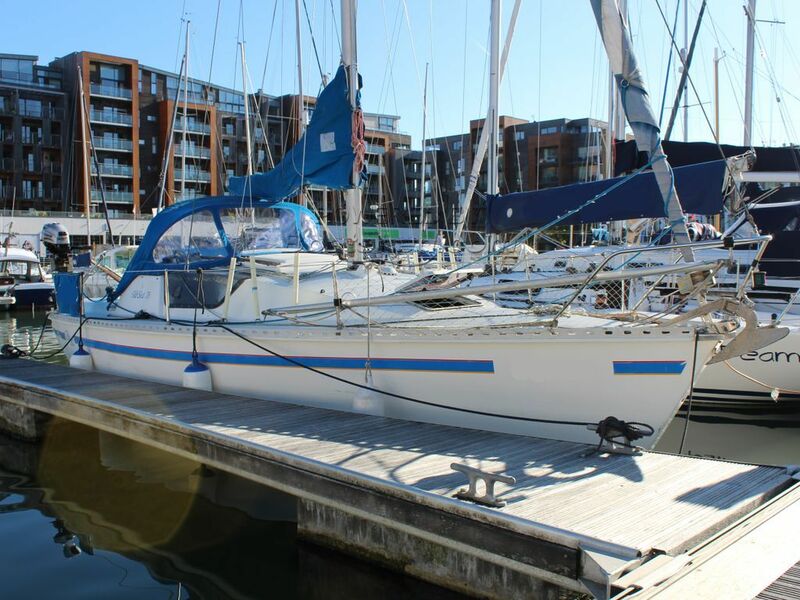 The current owner has undertaken many jobs that have improved her look and performance including a new spray hood and life raft. She has been anti fouled last year and the dinghy is 2 years old. There are a couple of areas that could do with a bit of work notably the headlining in the aft cabin but this isn't really a big job. A couple of hours with some glue and cif and she would look as good as new. I think if I was to buy her I might add a shower. The flooring and upholstery look in good condition although maybe not to everyones tastes, and although I love the open plan saloon/ forepeak (Which is a design that is coming back into fashion with these size vessels), I think I would add a simple curtain for a bit more privacy for guests. Other than these, which are personal preferences, she appears to have been well looked after and will be a really good and fun boat for someone. This GibSea 76 has been personally photographed and viewed by Oliver Yates of Boatshed Bristol. Click here for contact details.